Spacious, open floor plan with contemporary furnishings and the warmth of wood floors and beamed ceiling make you feel welcome from the moment you walk through the door. 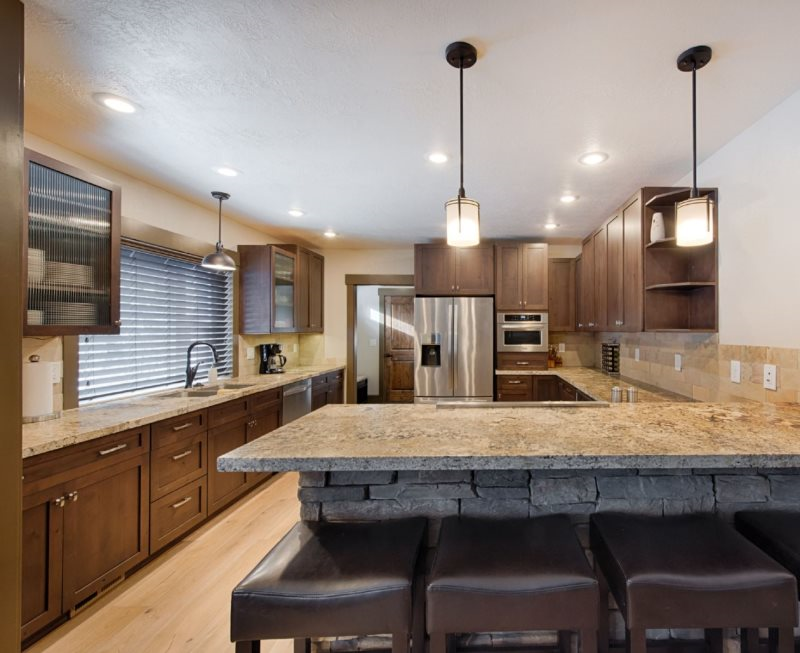 This stunning, newly remodeled home is located on a deep, forested lot. Open back deck and patio area which includes a fire pit. Comfortable seating for everyone in the living area and lounge or at the dining table. Keep the Chef company at the counter – better yet, join in on prepping a great meal in the roomy kitchen with counter space and state of the art appliances that would be the envy of any accomplished cook. Quiet, “Soft Hinge” drawers and cupboards are a nice feature and the five burner, gas range and two ovens are sure to contribute to some amazing culinary creations. This lovely home accommodates up to 8 guests in style and elegance in four private bedrooms and three bathrooms. Two bedrooms are located downstairs, each with a queen sized bed that share a hallway access bathroom. Upstairs is a large Guest bedroom with queen sized bed, hall access bath with soaking tub and a luxurious Owner’s Suite with a spectacular “Bathing Room” that has a propane fireplace, “Two tubs and a View” – does it get much better than this? Guests of Lazy Deer Landing will enjoy an enviable, central location for accessing downtown McCall, Payette Lake and lakefront parks and beaches. Don’t forget your discs - just across the street is a nine-hole Frisbee Golf course that neighbors the beginning of the “Valley Rails to Trails” path where you can ride or glide for miles depending on the season. Bring your pass and gear or stop by the downtown Brundage Mtn. office for your lift ticket and any one of several shops that can outfit you for any kind of outdoor adventure year round. Don’t forget to visit our very own Ponderosa State Park for an amazing experience. Whether you walk or ride, you’re never more than ten minutes from fun in any direction including great dining and shopping.